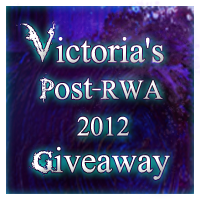 Victoria H. Smith: Post-RWA 2012 Swag Giveaway! I received many books at RWA 2012 this year, and here's my follow up giveaway post. I'll run this one for about two weeks to give people plenty of time to enter. So here it goes. I have the following stack of YA books and NA books to giveaway. Love Story by Jennifer Echols is signed. So, how this giveaway will work is that there will be two winners. The first drawn will get their pick of three books and the second person drawn will get what's left. The giveaway ends 8/17. So many amazing books I would say Abandon or Fated just because I like the author's other books! Thanks so much for this giveaway! Love, love, love the new look by the way! I want to read Abandon. Fated or Embrace probably! Thank you for sharing with us! Thanks for the giveaway! I would want The Taker the most! Abandon, I have been wanting to read that for a while! How very kind of you to share your spoils! I can only imagine how much fun you had at the conference. I would want Catching Jordan. Thanks for the giveaway! I would want The Taker the most - Thanks! Oh tough choice, but I would have to go with Embrace, with the Taker really coming in a close second! Thanks for the chance at this great giveaway! All anticipated reads or great reviewed books. How was the event? Thanks for offering this giveaway. I'd pick Catching Jordan. Thanks for the giveaway, Victoria! Can't wait to read your book! Oh gosh, so many great choices. I'd have to choose between Love Story, Fated and Embrace. SO MANY TO PICK FROM!!! Um, Love Story or Abandon :D Thanks for the amazing giveaway!! 'love story' b/c i love jennifer echols' books! thank you! I'm having trouble with the form. It says the page doesn't exist. I would love to get Embrace by Jessica Shirvington Thanks for the great giveaway! Fated and Love Story would be my picks! I think I'd have to go with Embrace! Great giveaway! Thanks! I really want Catching Jordan!! !